We could not have expected an event less grand than when Chowking officially welcomed Kris Aquino as their newest franchisee last week at White Space in Makati City. Although we had to wait a while, with a handful of bouncers all over the place, we kind of expected it to be well secured since the main person is a member of the first family. The members of the media were given Chinese treats as we waited for Kris. A favorite from amongst the treats was the Chinese Calligraphy. Above is the actual video I took while the Chinese Calligrapher was skillfully drawing my wife's name on a xuan paper (or Shuen paper or rice paper, is a kind of paper originating in ancient China used for writing and painting). As we were called in to the banquet hall, we were all eyes through the Wushu exhibition right before the main program. Everything of Chinese tradition were squeezed in the program, including a dragon parade. It is always expected of an endorser to highly believe in the product he or she is endorsing and Kris has always been very credible in this department. 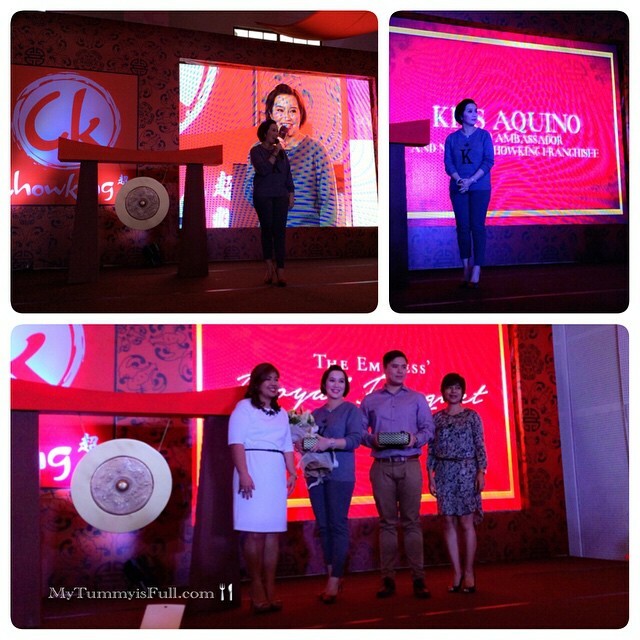 Kris Aquino, the Philippines’ Queen of All Media is set to open her first Chowking franchise this November 2014, located at Ali Mall in Cubao, Quezon City.